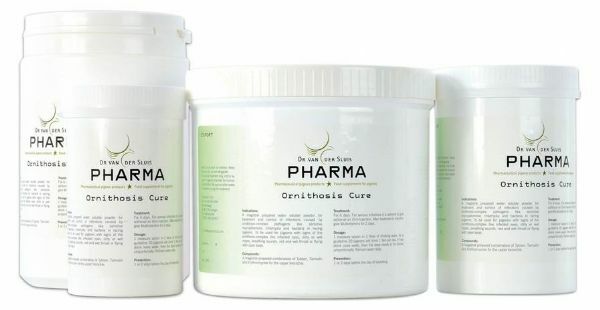 A magistral prepared water soluble powder for treatment and control of infections caused by ornithosis-complex pathogens like sensitive mycoplasmen, chlamydien and bacteria in racing pigeons. To use with pigeons with signs from the ornithose-complex like infected eyes dirty or wet noses, breathing sounds, red and wet throat, flying with open beak etc. 1 spoonful per 2 litre drinking water during 6 days When 20 pigeons drink more than 1 litre a day reduce or raise the dose proportionally. Cure: 6 days. If serious infections occur, the advice is to give additionally an injection with Orni-Injection. After treatment or injection give multivitamins for 2 days. 1 or 2 days before the day of basketing. a combination of macrolid antibiotics for the upper bronchia.